Ready to learn the question words in Spanish? One of the best ways to advance your Spanish skills is to converse with fluent or native speakers. But how do you break the ice? Start by mastering the new vocabulary in this guide, and then practice some of the most commonly asked questions. People love being asked questions! It shows you’re interested in their opinions and experiences. After reading this article, you’ll feel more comfortable meeting new people and making friends in Spanish. Learn new words, phrases, & conversational skills in one of our FREE online Spanish classes. Let’s go over some of the most important question words in Spanish. Memorize this vocabulary so you can be ready to strike up a conversation when the opportunity arises! If you look closely at the sentence structure of these questions, you’ll see that in Spanish, you don’t need to add a word for “do.” For example, “How do you make that?” would literally be translated into Spanish as: ¿Cómo lo haces? (How you make that?). It sounds funny when translated literally, doesn’t it? This is one example of a basic language translation fact: we translate ideas, not words. ¿Quién es? (Who is it?) Note: Use when answering a phone or door. Another thing you’ll notice is that when quién is used plurally, referring to more than one person, it becomes quiénes. Be aware that when used in isolation, “¿Cómo?” means the same thing as “¿Qué?” You’ll hear Spanish speakers using both of these phrases. ¿Cuándo es? (When is it?) Note: Use for social events or appointments. Sentence structure for questions isn’t too different from English. The basic structure for all of these starts with the question word and is followed by the conjugated verb in the appropriate tense. Remember how quién became quiénes? You’ll also notice that when cuál is used in the plural form, it becomes cuáles. In the first two examples, take note that Spanish uses the word for “which,” rather than “what” as we’re used to in English. 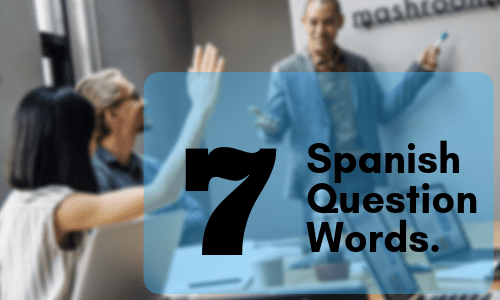 It’s vital to learn these seven words, because you can’t ask questions in Spanish without them! Study these essential Spanish question words to really take your conversation skills to the next level. Need more help forming questions in Spanish? Check out the video below from one of our online Spanish classes. You can also take private lessons with a Spanish teacher, online or locally. You’ll get hands-on instruction and instant feedback on your grammar and pronunciation. Buena suerte! Post Author: Jason N. Jason N. tutors Spanish in San Diego, CA. He majored in Spanish at UC Davis, and studied Spanish Literature at the University of Costa Rica. Learn more about Jason here!